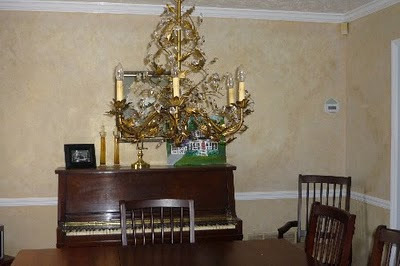 Brandi Nell the Southern Belle: Maura's Dining Room Makeover! Hope everyone is having a fab week! I am so excited to share today's post with y'all! This is an amazing reno! 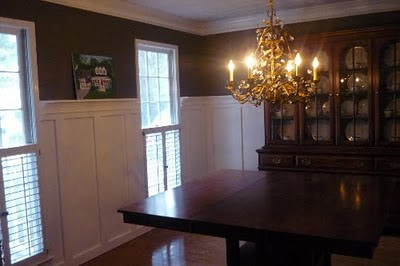 My sweet friend, Maura (who also runs the FAB blog 365 Atlanta, where she highlights events and places in and around Atlanta - CHECK IT OUT) agreed to let me showcase her gorgeous Dining Room transformation. My husband and I live in a Cape Cod-style cottage in Johns Creek. Our style is informal, cottage-y, eclectic. Our dining room was very chic and stylish...in 1987. After 4 years of living with it in favor of tackling other, larger projects in the house (new roof, new kitchen, back porch/patio/retaining wall/garden, etc.) we finally couldn't stand it anymore. 1987 had to go. 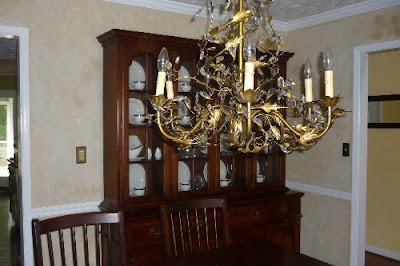 The main issues in the room were: metallic gold faux-finish treatment on the walls; wimpy chair rail and crown moulding, courtesy of a lazy builder; and ugly, outdated window treatments that were (yep, you guessed it) more shades of metallic gold and bronze. In other words - not at all appropriate for our little Cape Cod and not at all appropriate for the new millennium. The only good thing was the chandelier, which I bought at Ballard's Outlet for a whopping $70.00 (regular price: $400.00). 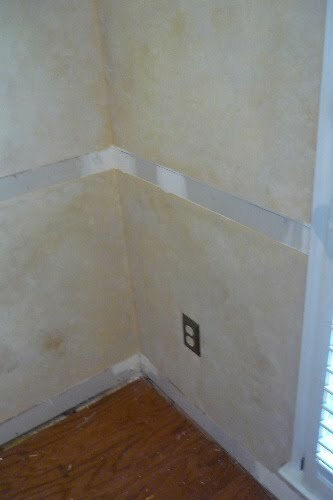 First, we removed the chair rail and baseboards, which were standard builder-style. Unfortunately, the builder had used both nails and liquid nails to affix them to the walls, so we damaged the walls a bit during the removal process, but thankfully, we have really great painters who are aces at fixing that kind of thing! All of the wood we installed to create the new moulding was purchased pre-primed, since we planned to paint it all white anyway - saved our painters a step! 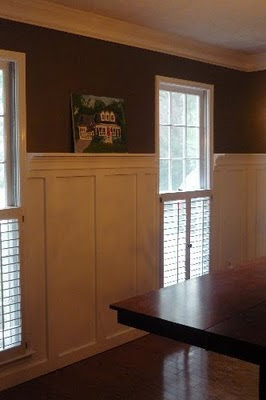 Using 1x4s we installed new baseboards, to give it a cleaner, more Craftsman-style look. Then we cut 1x4s into 4.5-foot tall pieces and began installing them at 16" intervals all around the room (we had worked out the math ahead of time to make sure it would work evenly around the room). Each corner got a double board in order to anchor the room. On top of the verticals, we put up 1x6s all around the room, on which we installed the shelf, all the way around. The shelf, made of 1x4s sitting atop standard casing (look in the crown moulding aisle at your local Home Depot or Lowe's and there are a number of options to choose from. Casing is simpler to use than crown moulding, which would also work but would require more intricate cuts. Additionally, casing is substantially less expensive than crown moulding, making it an even more attractive choice!). We also beefed up the existing crown moulding by dropping down two inches and adding a row of base cap (also found int he crown moulding aisle at your local home improvement store) all the way around. Our painters painted the existing crown, the two inch space of wall and the base cap glossy white to create the illusion of a of more substantial crown moulding, which balances the room better, especially now with the heavier new moulding/paneling on the bottom. 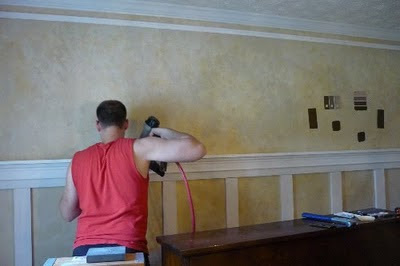 We settled on a Behr paint color from Home Depot, with the incredibly original name of "Traditional." Our painters used Eggshell paint for the brown, and a glossy, oil-based true white to match the rest of the moulding in our house and to really set off the chocolate brown. 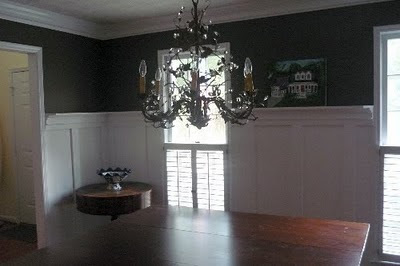 The result (in my humble opinion) is a classic semi-formal dining room, appropriate for our Cape Cod-style cottage. It can be dressed up for holidays, but is not too stuffy. 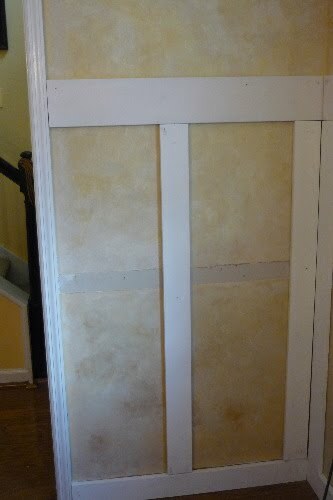 Here's the skinny: the cost of the lumber and other materials was around $300. Our painters repaired the walls, caulked all of the woodwork and nail holes and painted for around $350. For substantially less than we would have paid a trim carpenter to create the room for us, and it was surprisingly easy. The most difficult part was the measuring (once, twice, three times) to accurately space the vertical boards and purchase the right amount of lumber and make the best use of it without too much waste. Our job was made much easier by borrowing a friend's compound mitre saw and nail gun and compressor; however, a hand saw and mitre saw could have been used with a bit more muscle required and we did use a traditional hammer for much of the project, until we got to the shelf installation and crown moulding. All in all, it was a relatively simple transformation that looks much more difficult and impressive than it really was! With a little planning you can completely change your space...and amaze your friends! 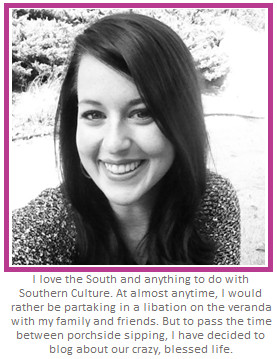 Maura Neill is a REALTOR in Atlanta and a DIY-enthusiast (a.k.a. cheapskate. Why pay someone else to do what you can do yourself?). 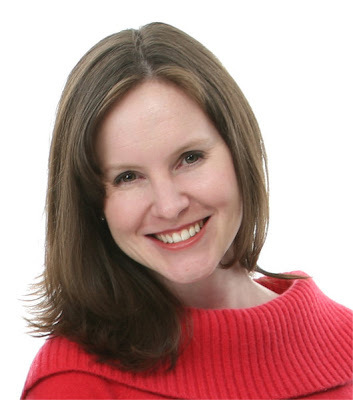 She is also the Founder and Editor of 365Atlanta.com, your guide to the best things to do in Atlanta, one day at a time. She lives in her adorable Cape Cod with her husband, Ben, their three crazy cats, and Charlie the Wonder Beagle. Thank you so much, Maura for letting us sneak a peek in your home! That is quite the transformation! You and Ben make a great team! Hope ya'll enjoy the rest of the week! Hey Amanda! So very glad you dropped by! And yes, I am impressed with this transformation also! What a gorgeous transformation! The room looks so much taller now! 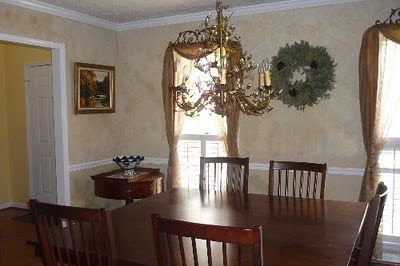 And I love that she picked a deep brown for the walls, such a bold move with a fantastic outcome. Thanks for sharing this, I loved every second of this post! Great job! Beautiful outcome. Would you mind explaining the process you used to determine spacing? New Cornice Boards for the Bedroom! YAY! We are today's DIY Show Off Feature! !